What is it about the workplace that creates behavioral expectation different than those in our personal life? Can we truly ignore our emotional reaction to the perceived way a co-worker or manager treats us? Would we want to remove an emotional response or incorporate it for improving communication and teamwork? What is the balance between being challenging versus being disruptive? Last month I had the opportunity to present a lunch and learn program to a company on the subject of “Dealing with Challenging People.” I learned that with everything in life we often forget there are two sides to each story. Most importantly managing by facts will determine if the person is actually “challenging” or if their behavior is caused by an external stressor or lack of guidance within the workplace. Of course there will always be people who need to have the last word, who are continually trying to pick a fight, who have a constant chip on their shoulder or whose time it is to move on from the company. Let’s look at people who in our heart of hearts are not described above, but rather are people who are experiencing a personal setback, who are trying to fit into company culture or who, with a bit of coaching, could assimilate to different personalities. During my lunch and learn, one of the attendees shared with the group that she was proud of being a co-worker known to be challenging — she embraced the personality trait as a great attribute because her definition of challenging was being aggressive and goal oriented (she managed the sales department). As I facilitated the session, I asked the co-workers to provide input as to whether they thought she was challenging in a negative or positive way — the majority felt negative. This was truly a wake-up call that had never been addressed — management style vs. the emotional reaction to the way one is treated (the co-workers felt belittled and put down). Two sides to each story! Let’s assume most challenging circumstances occur when we are not patient with others, not fulfilling their needs, not understanding that they may be experiencing a personal setback or most importantly not having assimilated to the stresses of their job responsibilities. In most of those cases, the challenge occurs because of lack of communication of needs. Again, during my session, one co-worker shared with the group he was bothered by people coming late to meetings, showing disrespect. While I thought he made a reasonable point, others suggested he should get over it or should deal with it. They thought he was being challenging over something that did not have merit while he thought his co-workers were being challenging by not respecting his time. Again, two sides to the story! These examples may be considered to be straight forward, and that their resolution achievable through compromise. However, what is often overlooked in the workplace are those situations when an employee is challenging due to personal setbacks. While the workplace is often not the place to discuss personal challenges, it is only natural that the lines will be blurred between personal and professional obligations. For instance, when I suddenly lost my husband, I cannot imagine how difficult it was for my co-workers to work side by side with me — they didn’t know how to interact with me and I did not know what I needed. As a motivational speaker, grief consultant, trainer and facilitator, Rachel Blythe Kodanaz provides encouragement to those who are suffering a loss. Her experience in management at Fortune 100 companies and the death of her young husband provides insight into challenges and solutions supporting grief in the workplace. 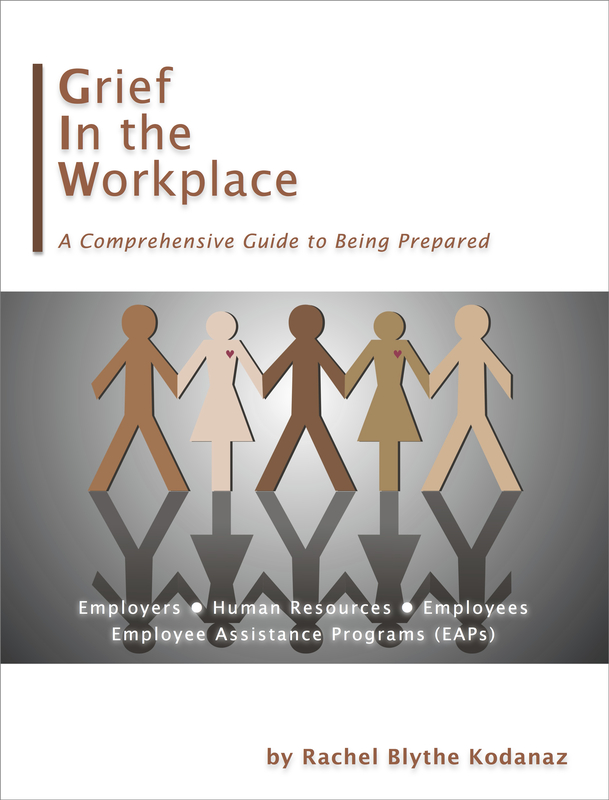 Rachel is the author of Grief in the Workplace: A comprehensive guide for being prepared; Living with Loss, One Day at a Time; and has appeared on Good Morning America. Next → Next post: Rachel, are you over your loss?